As I mentioned on Tuesday's blog on Ilha Bela, when we were pulling into the boat ramp under low power, a large sea turtle popped up its head next to us. A photo could never convey how gorgeous it was (and it's a good thing too because I didn't get my camera out in time). He quickly tucked his head back under the water and glided onwards. I almost fell out of my seat trying to watch it, while the two long-time residents of Ilha Bela with me looked on. I said to them "ah, you must see them every day" and they answered "yes, we do and many of them." Then Marcelo said "but, you know what? It never gets boring." And that's how I would feel, I think. I certainly can't visit any town that has a unit of Projeto Tamar without stopping in. But I get ahead of myself. 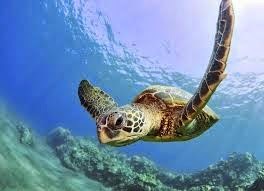 For those of you who know little about the sea turtles, they are migratory animals. They don't have established homes and are known as sea travelers. Only when it is time to lay eggs do they return to the beach where they themselves were born. Yep, the very beach. They bury the eggs in holes in the sand. For a beautiful video on the egg-laying and eventual run for the sea, look here. Here in São Paulo state, the egg laying time is from September-March. As in, now. Maybe the turtle I saw was coming back from egg laying though that coincidence would be a little unlikely, no? I just read that of 1000 turtles which are born, only 1-2 reach adulthood. Those odds are not good. It takes 30 years for them to become adults, when they become anywhere between 65 and 750 kilos (140-1,600 pounds). Source for all this here. 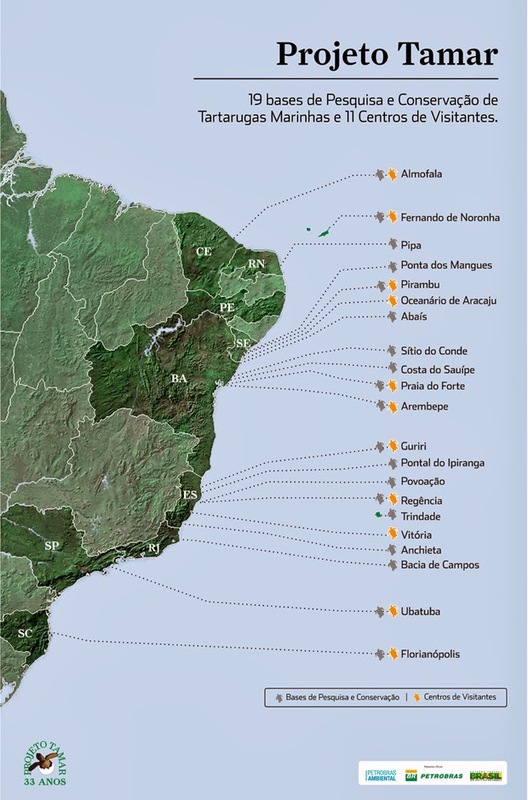 The Brazilian organization that works to preserve sea turtles is called Projeto Tamar. I am not sure exactly what Tamar means but it rhymes with "Amar" or "love" which is appropriate. With 19 bases now in Brazil, this organization (supported by Petrobras the state-owned oil company) does research, educates and rescues sea turtles. While I find the support of Petrobras somewhat ironic, frankly we have to get the money somewhere and Brazil is not known for charitability. However, I'm guessing there are not too many studies being done on the effects of the pre-sal or new oil reserves on the survival of turtles. One of the studies that IS currently being done and is available online is about the effect of light pollution on newly-born turtles. And it's just what you would expect: the little turtles get disoriented by the light, thinking it is on the horizon, and die as they cannot get out to sea. Now, as you may have read yesterday, the port of São Sebastião is planning to grow 30 times in capacity...and I'm guessing part of that will be lots and lots of lights as the ships dock even at night to unload containers. A little killing ground for turtles. Or so I imagine. The biggest killer of sea turtles, according to Projeto Tamar, is being caught in fishing nets. Not sure if that will change. I might have to pay a little visit to the local Projeto Tamar, in Ubatuba, and ask some questions. For more info, see Projeto Tamar. Their site is available in English. In the meantime, I say to you little turtles, run, run, run and swim swim swim...away from the light! Cool!! Thanks for that update...it makes perfect sense and I do love that it sounds like amar as well...love those sea turtles!